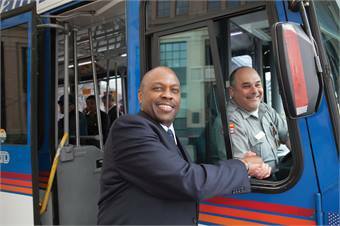 Regional Transportation District (RTD) GM/CEO Phillip A. Washington was selected for the Outstanding Public Transportation Manager Award by the American Public Transportation Association (APTA). This prestigious award honors a public transportation manager who has made outstanding contributions to the public transportation industry. “Phil Washington embodies a level of excellence in all that he does. From his innovative approach toward seeking solutions, to his emphasis on the importance of developing leadership, to his work with the community, Phil is being recognized by the public transportation industry as an effective and innovative leader and role model,” said Michael Melaniphy, APTA president/CEO. 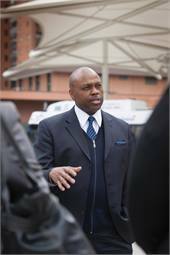 Washington has served at the highest executive levels of the Denver Regional Transportation District for 14 years, including the past four as the transit agency’s GM/CEO. During Washington’s tenure, RTD has undertaken a remarkable number of innovative, cost-effective and customer-focused initiatives to build projects and improve service to the public. The most visible is RTD’s FasTracks Program building 122 miles of new commuter rail and light rail, 18 miles of bus rapid transit service, adding 21,000 new parking spaces, redeveloping Union Station. The W Line, RTD’s first FasTracks-funded rail line, opened this year eight months ahead of schedule and within adopted budget — adding 12 miles of light rail for an RTD systemwide total of 47 rail miles. RTD, like other agencies around the world, has been tested in keeping the program moving forward. Washington challenges staff to create innovative approaches, such as partnering with the private sector on the Eagle P3 — a $2.2 billion project which includes the East Rail Line to Denver International Airport, the Gold Rail Line, a segment of Northwest Rail, the commuter rail maintenance facility and rail fleet. The project is 50% complete, opening in 2016. Anderson noted it is fitting that Phil Washington will be officially honored at the APTA Annual meeting this September in Chicago, since he grew up in the Altgeld Gardens Housing Projects on the south side of Chicago, was transit dependent as a youth and personifies the fact that the public transportation industry offers career opportunities for all individuals. RELATED: "Denver RTD Generative Innovative Ideas to Fuel Expansion."